“I Hear His Footfalls Music.” Trade card, A.B. Seeley, American, 1881. Chromolithography. Overprinted with advertising for Charles & Co, Grocers. “Ha! Tis He The Maltese Me Rival.” Advertising Trade Card, A. B. Seeley, American, 1881. Chromolithography. Overprinted with advertising for “Our Little Beauties” Pressed Cigarettes. 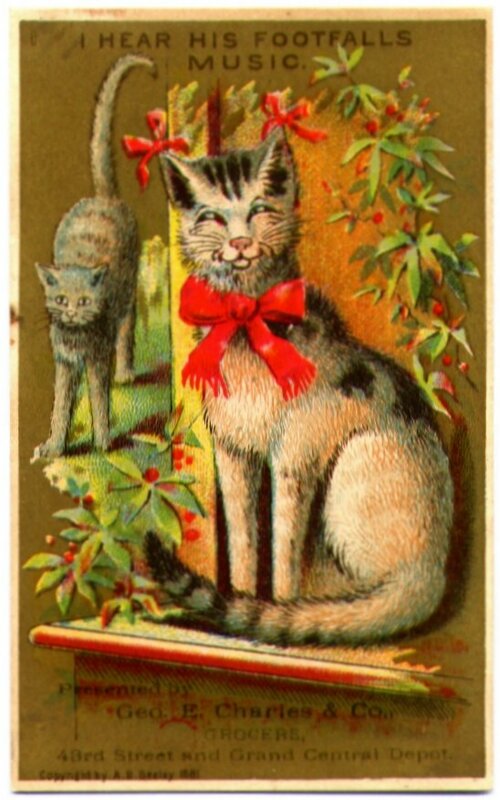 Our topic today is love — feline love as these comic trade cards present it. This is a series copyrighted in 1881 by a printer named A. B. Seeley. For those of you unfamiliar with advertising trade cards, these small images (about 2 1/2 by 4 1/2 inches in size) became popular as a novel form of advertising in the 1870s. Local businesses often bought printed trade cards and had their names and other information added on the back side and front. Three different businesses are represented in this assembled set. Advertising trade cards were advertisements, but they were also intended to be collected and saved. Tens of thousands of them survive because people did just that, often pasting them into albums as a pastime. “Well Sir, What Are You Going to Do About It?” Advertising Trade Card, A.B. Seeley, American, 1881. Chromolithography. Overprinted with advertisement for Geo. E. Charles & Co. Grocers. This set of comic trade cards survives in numbers enough to suggest that it appealed to both business owners and collectors. 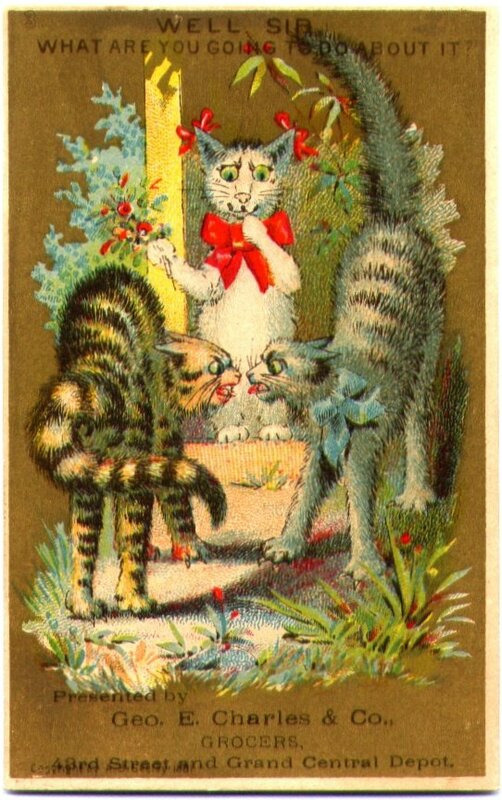 It tells the story of a love triangle: the protagonists are a female house cat (wearing a red bow), a male house cat (blue bow) and a dark brown striped tabby who, it is implied, is an alley cat. The set is full of comic references that would have been clear to many people at the time, and I’ll discuss a few that I have figured out below. First, however, let’s talk about cats in love. 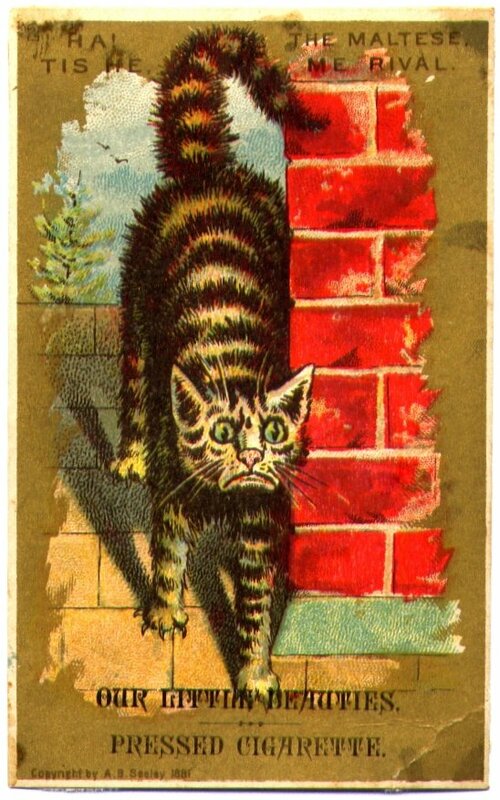 At the time this set was published, almost all pet cats spent at least part of their lives out-of-doors. The reasons for this blend custom and practicality (this is a world without cat litter, after all). In the countryside and the city, many cats were not pets at all; they worked for their livings controlling rodents in barns, livery stables, warehouses, and the garbage-stewn alleys of urban neighborhoods. Not only that, but all cats, even the most beloved pets, were sexually intact. Fighting tomcats, females in heat and subsequent litters of kittens were all part of neighborhood life. “For Pity Sake Gentlemen Be Calm.” Advertising Trade Card, A. B. Seeley, American, 1881. Chromolithography. 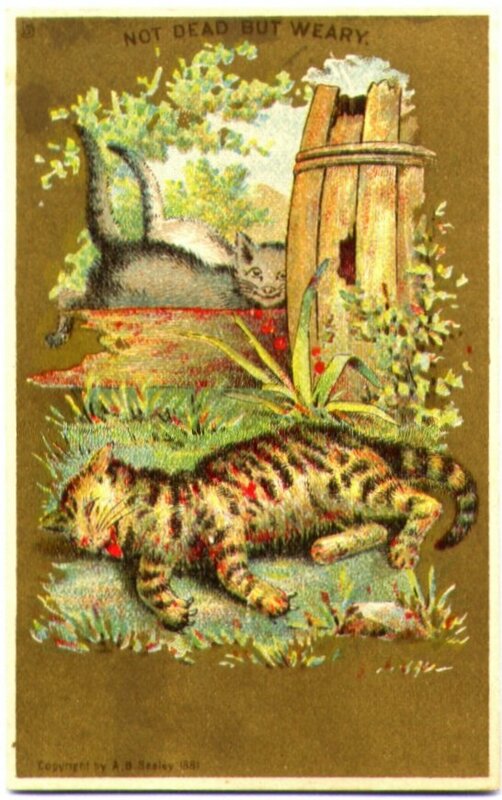 “Not Dead But Weary.” Advertising Trade Card, A. B. Seeley, American, 1881. Chromolithography. Two of the cats are identified as house cats by the ribbons around their necks. The female is ready for courting — that is, mating. In this story, the tough alley tomcat is outfought by his house-pet rival although he insists that he got the better in the fight. But while the cards tell a likely story about cat behavior, the cats also have human characteristics — and this is what makes the card humorous. The story is a double story, of cats and of people. too. This is an example of what scholars call “anthropomorphism,” where human characteristics are attributed to animals. Aesop’s fable rely on anthropomorphism to teach a moral lesson; here it is used to deepen the humor of the story. 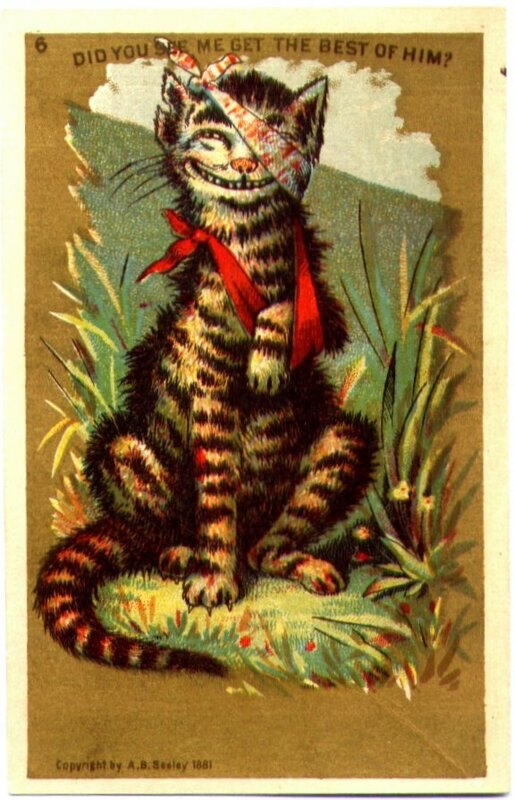 “Did You See Me Get the Best of Him?” Advertising Trade Card, A. B. Seeley, American, 1881. Chromolithography. We can “get” the basics of the humor in the story, even from a distance of 130-plus years. But there are other elements that at least adult viewers at the time would have appreciated. 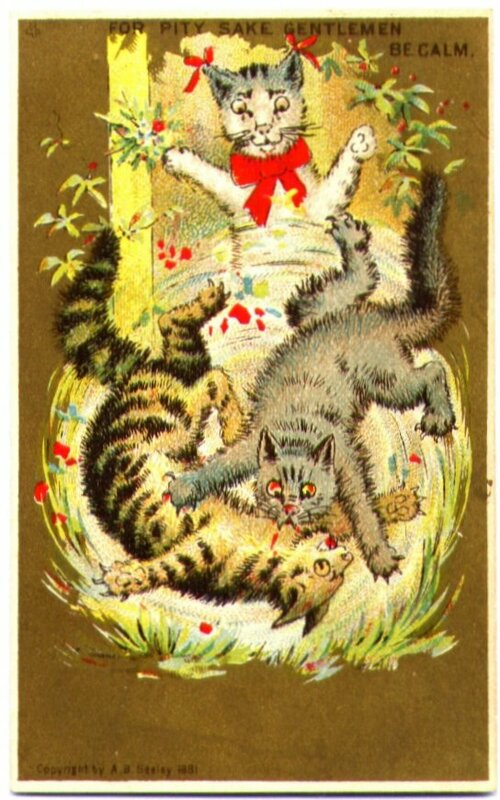 In the first card, the girl-cat thinks, “I Hear His Footfalls (sic) Music.” This is a quotation from a popular sentimental poem and song titled “Waiting.” The words are by Ellen H. Flagg, who enjoyed considerable popularity after the Civil War for a poem about dying soldiers titled “The Blue and the Gray.” The caption of the second card, when the striped tomcat notes the appearance of “me rival,” suggests that he is an Irish street tough. He’s an interloper, too; the girl-cat is clearly waiting for her social equal. The street tom is thrashed by the upper-class house cat, who still retains his spiffy blue ribbon as he and his lady love leave the scene. I am still working out the source of “Not Dead but Weary,” the caption on the fifth image. My sense at this point is that it is baed on a biblical reference or a hymn. The concept of weariness was often used to describe a mental state at the end of life. The final image, where the defeated tom insists that he won the fight, is a cat version of a type of comic image associated with both street fighting and boxing. I’ll keep working on parsing out the meanings of the captions, and I’ll report on what I find. In the meantime, I think I can say that what made this set of images so popular is their double meanings, a report on feline love and a genre story about a cross-class rivalry for the hand of a pretty girl that includes a satire on sentimental culture.